Today marks a turning point in my life. 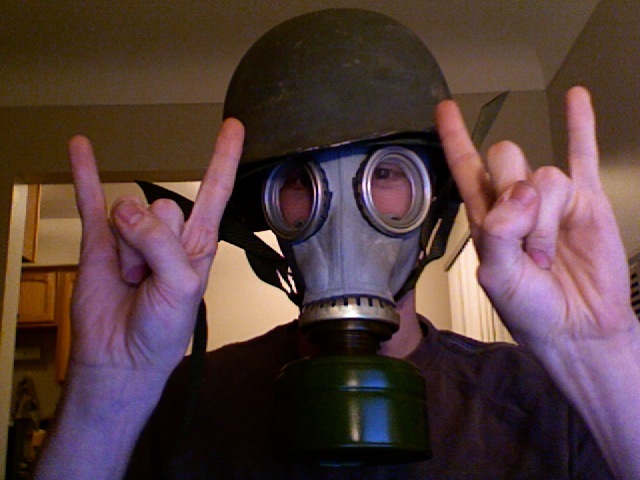 For today… Today, I purchased an army surplus gas mask. Bask in the warm glow of my safety from malicious chemicals. Damn, my mustard gas attack on Minneapolis has now been rendered USELESS! Nope. Bought it special. And it’s WAY nicer than yours. Just to let you know. Damn. Now THAT is METAL!!!!!!! GLAAAAARRRAAAAARGH! Metal high five! Any… particular purpose? Or just because its freakin’ awesome? Costume for the music video I’m working on. I want to see Antics attack a major American metropolis with mustard gas. And I want to see Antics get attack Hollywood and get some TALENT. The song is Cartographics by Antics. We’re playing up the whole maps/borders/boundaries theme, including some crypto-Soviet imagery and a peasant rebellion. Oh, and a mind control ray. Did I mention the mind control ray?